Stewart Herbarium, Gordon College, Rawalpindi. Trees or shrubs. Leaves opposite or alternate, simple, exstipulate. Inflorescence cymose, panicles or heads; involucral bracts herbaceous, petaloid or absent. Flowers uni or bisexual, regular. Sepals 4-5, united, adnate to the ovary, valvate. Petals 4-5, imbricate or valvate. Stamens same in number as the petals, both inserted around a disc, the stamens alternating with the petals. Ovary (1-)2(-4)-locular, syncarpous, inferior; stigma capitate or 2-4-fid; single ovule in each locule. Fruit a drupe, 2-seeded, free or united in a syncarp. A family of 14 genera and about 90 species, mostly tropical and temperate in distribution, especially in N. America and Asia, rare in Africa and S. America. Represented in Pakistan by 1 genus. 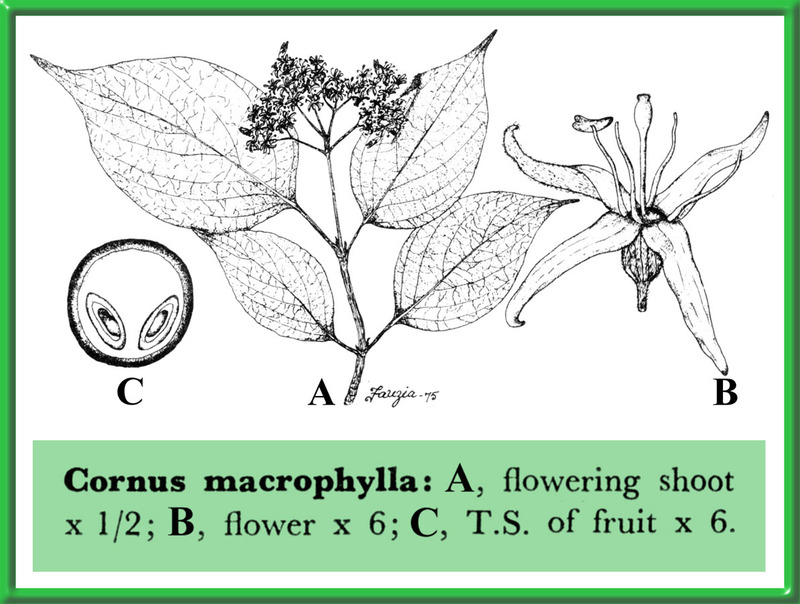 Alangium, previously included under Cornaceae, is now placed in a unigeneric family, Alangiaceae, differing from Cornaceae in its 1-seeded fruit, bitegmic seeds, articulated pedicels and subulate bracts. Acknowledgements: We are grateful to the United States Department of Agriculture for financing this research under P.L. 480. Thanks are also due to Mr. I.C. Hedge and Miss J. Lamond of the Royal Botanic Garden, Edinburgh for going through the manuscript and giving valuable suggestions. Svida Opiz = Cornus Linn. Thelycrania (Dumort.) Fourr. = Cornus Linn.